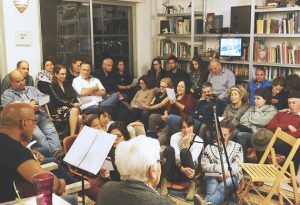 Memories in the Living Room offers a meaningful way to commemorate Yom HaShoah and to address its implications. It is a traditional way of gathering those who wish to come together in a relaxed setting to share stories through talking and listening. Jewish Care is organising events in Pinner, Loughton, Golders Green and Hendon. The one in Pinner will be taking place at the home of Edwin & Linda Lucas on Monday 29th April at 7.30 pm. Please let Edwin and Linda know if you are coming or contact the office. For more details, go to jewishcare.org/events or call Michael Sobell JCC on 020-8922 2908.